We know high oil prices have an adverse impact on the economy, often leading to recession. According to Economist James Hamilton, 10 out of 11 of US recessions since World War II have been associated with oil price spikes. But where do continuing high oil prices lead us? How will economic contraction “play out,” if tight oil supply and high oil prices continue? Figure 1. Structure built with blocks. 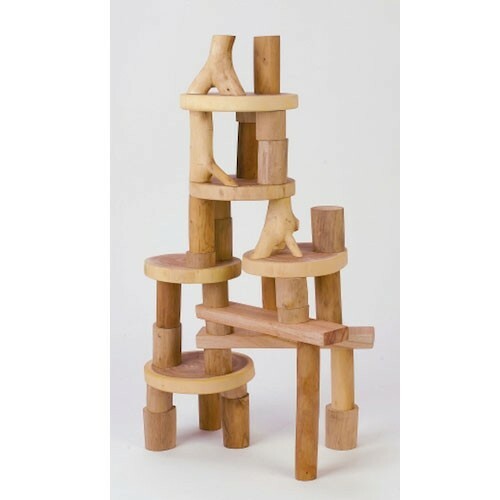 (Barkless tree blocks from http://www.childmode.com) Our economy is also built piece by piece, based on the rules and prices that are in effect when individual decisions are made. Clearly there are many possible ways forward. Using Figure 1 as an analogy, there is the theoretical possibility of continuing to build our economy to ever-higher heights, as we are told by economists and politicians, despite the obstacle of high oil prices. There is the possibility of taking down parts of the economy, and rebuilding in a more fuel-efficient manner. There is also the theoretical possibility of eliminating unneeded parts of the economic structure we have built to date, so that the structure is more compact. And, unfortunately, there is also the possibility that a major portion of what we have built to date will inadvertently be knocked down, as constricted oil supply makes its effects known. Before discussing what paths may lie ahead, I would like to talk about how contraction of an economy differs from continued expansion. It is easy to assume that economic contraction is similar to economic expansion, just with the sign reversed, but anyone who has lived through the last few years knows that this is not the case. For example, on the way up, it appears that the size of the current economic system easily “scales” upward, as the economy grows. The number of available workers gradually rises, as does the number of job openings, and the amount of goods and services produced. Everything rises together, and the system “works”. On the way down, there is a good deal more “stickiness” to the system. There are now seven billion people on the planet, and they all would like to eat on a regular basis. There are perhaps two-thirds as many potential workers, and most of them would like to have jobs, even if the economy is contracting, and their particular job is disappearing. Another issue is that we have built millions of miles of electrical transmission, oil and gas pipelines, water and sewer pipelines, and roads. It becomes difficult to abandon parts of these systems, even if total resources for maintaining the system are constricted. If we think of the situation in terms of tax dollars (or charges by utility companies), it becomes increasingly difficult to collect enough tax dollars (or utility charges) to pay for the inflated cost of replacing worn out roads, pipelines, and electrical transmission, as the rising price of oil makes these costs rise much more rapidly than salaries. 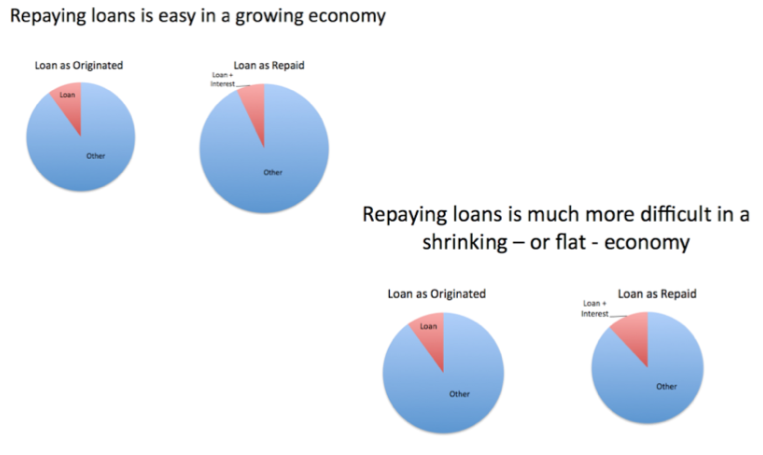 Another issue is debt repayment (Figure 2). We are used to an ever-expanding economy, where future goods and services produced will always be greater than those produced this year. As long as this growth pattern persists, our system of long-term financing of major expenditures, even if the expenditures are not really income producing, can continue. For example, we are able to buy homes with 20 or 30 year loans, and governments are able to continue borrowing, claiming that they will have more funds to repay loans (with interest) in the future. Once the situation changes to a shrinking economy, it becomes much more difficult to repay loans, and the financial system quickly reaches the risk of collapsing, due to multiple debt defaults. A related issue is that of financing a new or expanding company. If the economy continues to grow, investment in a new company is likely to make sense because the value of the company can be expected to grow as the demand for products of the type it sells continues to grow. But if it becomes clear that the economy is on a path of long-term contraction, the possibility of failure within a few years rises, so new investment makes much less sense. Where may continued high oil prices lead? 1. Widespread loan defaults, leading to far less international trade and the manufacture of fewer high-tech goods. This is my personal view as to a likely outcome of continued high oil prices, unless some approach is developed that will somehow allow economic growth to continue, despite limited oil supply and high oil prices. Renewables at this point are higher priced, and not helpful in this regard. In this situation, widespread loan defaults would lead to impaired credit availability and difficulty in arranging international trade. Individual countries would presumably continue to issue their own currency, so local trade would continue. In the new environment, countries with debt default problems, such as Greece, would likely have difficulty buying oil (and other scarce goods) without something (besides Drachma) to trade in return. With limited international trade, there would likely be disruptions to oil and gas extraction, since workers and equipment are traded internationally today. At some point, it may be difficult to make high-tech goods like computers, because of the difficulty in assembling the many inputs from sources around the world. Political disruptions would seem to be likely as well. Some countries may even see civil war. Some countries may even break into smaller units, similar to the way the Soviet Union did in 1991. The timing is not clear, but disruption could come as soon as the next few months. The current problems with debt defaults in Europe would seem to have the possibility of spreading to banks and other financial institutions around the world. We don’t know how much of the system such a contraction would pull down. It seems to me that in the analogy of Figure 1, some vulnerable sections (like Greece) could be pulled down first, with others falling later. Bailouts may help temporarily, but at some point, the bailouts are likely to fail as well, because the underlying problem of restricted oil supply has not been fixed. 2. Planned contraction, with certain parts of the economy left behind. In this approach, particular unneeded segments of the economy would be discarded. For example, President Obama is planning military cuts. President Obama is also talking about merging agencies and eliminating the Commerce Department. In a shrinking economy, changes of these types are certainly needed. The problem is that the amount of shrinkage that is being proposed is far too small to have much impact. Another type of contraction that has been suggested relates to expenditures which seem unnecessary. For example, the US medical care system could be scaled back, because healthcare expenditures in the US accounted for 17.6% of GDP in 2009, far more than for other developed nations. Another area which might be scaled back is animal production on industrialized farms, since corn-fed animals are not good for health, and since the huge amount of meat we eat contributes to global warming. These are just two examples; each of us could name favorite boondoggles to eliminate. The problem is trying to get agreement on any kind of contraction, such as these. Our current system is the only one most of us have ever known. Most people are not aware of our need for change, and would resist changing what appears to be working at least somewhat well. Employees in the current systems would certainly be unhappy, because they would stand a chance of losing their jobs. If changes such as these could be made, it would be one way of contracting the current system, hopefully without crashing it. 3. Contraction away from the poles and other areas with bad climactic conditions. This appears to be a natural approach to contraction. It takes more fuel to heat homes near the poles. Homes also have to be built more substantially. If we look back at the historical record, populations have tended to be highest in warm climates–India, fairly warm areas in China, and the Middle East. According to scholar Angus Maddison, about 75% of the world’s population lived in these areas in the year 0 AD, and even in 2008, 68% of the world’s population lived in Asia. Northern countries of Europe and America have tended to have lower populations, but higher average real GDP (fueled by fossil fuels). This past week, newspapers discussed Nome, Alaska’s fuel shortage. They reported that a Russian fuel tanker was being used to deliver additional oil. If oil prices stay high, we will have an increasingly difficult time supporting populations that disproportionately need oil, such as those in very cold areas. High oil prices may also limit the amount of infrastructure repairs that can be done. If this happens, decisions will need to be made regarding which roads not to repave and which electric transmission lines not to maintain. I would expect that infrastructure that serves the fewest people would be most likely to be subject to cutbacks. These areas are likely to be in areas that are unattractive for settlement because they are very cold or very dry. (1) Old renewables, like wood, and small wind and water power that can be replenished with local materials. This category would probably also include draft animals. It would also include solar thermal water heaters, similar to hot water bottles that can be left out in the sun to heat water, since they can be made simply with recycled materials. (2) New renewables, like electricity from large industrially produced wind turbines, solar electric, and large hydro-electric dams, that require modern technology for building and repairs. Electric cars might also be in this category. In this section, I am discussing the first of these categories, Old Renewables. One concern is that at some point, perhaps many years from now, today’s whole economic structure will collapse (Figure 1). How this would play out is unknown. Perhaps we could continue to reuse parts of our current system. If not (for example, if difficulties with international trade greatly reduce access to fossil fuels), we may be faced with creating a new economy, based primarily on “old renewables”. The problem with this outcome is that old renewables are quite limited in their quantity. The world could not possibly support seven billion people. McEvedy and Jones, in Atlas of World Population History, estimate that if human population followed the population patterns of similar animals (gorillas and chimpanzees), world human population would be somewhere in the range of 70,000 and 1,000,000. This was the approximate probable initial human population, about 200,000 years ago. How far back population would fall in the case of collapse is not at all certain. As long as humans keep their ability to appropriate resources that might theoretically be shared by other species, their numbers will remain high. This propensity, however, is what leads to the tendency toward renewed growth, and new pressure on resource availability. Some people are hoping for a transition to new renewables–“unbuilding” the fossil fuel structure that we have, and trying to build a new one based on renewables instead. This approach may be appropriate for some wealthy individuals, but it is not clear that it has significant feasibility for society as a whole, because the cost of most new renewables is higher than that of the fuels they replace, making the high oil price problem worse, not better. If new renewables drop in price, this situation may change. The extent of today’s new renewables is less than many people understand. In the United States, renewable energy (including hydroelectric, biofuels, wood burned as fuel, geothermal, wind, and solar) amounted to 5.4% of total energy consumed in 2010, according to BP energy statistics. If we lived on today’s renewables alone, our per capita energy consumption would be roughly equivalent to that of India. India generally does not need fuel for heating, while we in the United States do. Taking into account the differing fuel needs, the average US citizen living on renewables alone would be somewhat worse off than today’s citizen of India. The other issue that people tend not to be aware of is that new renewables, as they are built and used today, are very much part of the fossil fuel system. They are built using fossil fuels, and they are maintained using fossil fuels. Except for biofuels, they depend on electric transmission lines, and these need to maintained with fossil fuels as well. Furthermore, if we are to maintain electric transmission lines, we need oil to maintain the roads that lead to the lines. We probably also need international trade to maintain new renewables, because replacement parts use minerals from many parts of the world, and depend on the availability of computerized systems to support production. If financial problems disrupt international trade, we may find that our “renewable” systems degrade quite quickly, because we are not able to maintain them properly. Nevertheless, there is a possibility that new renewables will soften the economic fall for those who have access to them, especially if issues of repairs can be kept at a minimum. Because of this, new renewables such as solar PV remain a popular choice among people who are concerned about continued economic contraction. If oil prices remain high, this view suggests that finding ways to use less should be our primary response oil limits. For example, responses might include planting gardens near home, getting people to change their light bulbs for more energy-efficient models, and building more fuel-efficient cars. While this approach has merit, it is not clear that this approach, in and of itself, is more than a small part of the solution, because of the bigger picture issues that are causing major strains on the system. Saving fuel in one place puts financial strains on other parts of the system. For example, a utility that fails because of bankruptcy could reduce electricity availability. What appear to be frivolous uses of our current systems (for example, game playing and downloading movies over the Internet), help to keep costs down for more serious users. Because of the complexity of our current system, savings in one area could cause problems in another section of our economic structure. Thus, this approach would shrink some parts of Figure 1. While this may somewhat work, there is also the possibility that this shrinkage will by itself cause strains or actual breaks in other parts of the economic system. All in all, we do not have firm answers. Instead, we have a number of views of how the downturn due to high oil prices may proceed, and appropriate responses to it. This entry was posted in Financial Implications, Planning for the Future and tagged fossil fuels, high oil prices, oil, oil prices, oil supply, recession, renewables. Bookmark the permalink. 67 Responses to Where do continued high oil prices lead us? High energy prices eventually makee the world’s product and service supply chains unsustainable. Since supply chains are interdependent, the combination of unaffordable transportation plus unaffordable production costs will rather quickly break down our current economic model of “just-in-time” production and delivery, and drastically reduce the number and variety of available goods and sevices. Since energy production too, is dependent on functioning supply chains of goods and services, we are unlikely to recover once the breakdown begins. Unfortunately, this will probably not happen slowly. Once the breakdown begins in earnest, the cascade effects could be quite rapid. I agree. It is these interdependent events that are hard to predict, and will lead the way down. Now we are closing three East Coast refineries, because East Coast refineries buying North African crude (which is high priced) cannot compete with refineries getting Bakken and Canadian crude, which is priced lower (due partly to pipeline bottle necks). But the East Coast needs to be able to refine its own oil, or it will be very dependent on the Gulf coast. In times of hurricanes, there could be supply shortages. A little redundancy is helpful for preventing breakdowns in supply chains. With regard to refieries and the effects of continued high oil prices. Thanks! I noticed that story. Europe is getting weaker. Also, more of the refining is coming to the US. We are the ones with the ability to refine very heavy crude into usable products; Europe has less of this capability. Furthermore, heavy crude can produce cheaper end products, if it sells at a big enough discount to light oil. The US is also being helped by being about to get some of its oil cheaply because of the Midwestern pipeline bottleneck. The currency we use for Money has been a proxy for Oil since Standard Oil first gained a Monopoly in the 1800s, which was then solidified when the Rockefeller and Rothschild banking houses gained hegemony over FSofA currency creation with the establishment of Da Fed in 1913. The value of all Fiat globally is tied to the Industrial economy based on Oil, and as this economy disintegrates, the value of the money based on it also disintegrates. Either the money supply will shrink in tandem with the shrinking supply of Oil, or the value of the money will decrease as more of it is printed into existence. In either case, real purchasing power for Oil and its products and services will decrease, creating a form of triage in the global economy. Marginal areas will be cut off, briefly keeping central areas still operating under this economy. However, the political consequences of the triage are more Wars and then further traige inside developed ecomies as various services are cut off or shrunk in size. The developed economies will see an ever growing population of “Have Nots” in the society, leading to further instability then the eventual breakdown of the Nation States. Local Economies will have to develop in order to fill the vacuum left by deteriorating energy dependent systems based on Oil, but they are unlikely to be sufficient to maintain anywhere near the current global population. Its impossible to say exactly how the necessary Global Population Reduction will run its course, how long it will take or at what point a new balance can be achieved with lower per capita energy resources. If you look at the work of Richard Duncan, we probably are going to see reductions in population and per capita energy available through at least 2050 or so before it might level off. How things proceed in various areas of the globe through this period are likely to be highly assymetric, so it will depend on exactly where you live as to how it will play out in that neighborhood. There isn’t a single solution here to this problem. I’d take a slightly more tortured path and say that money is a proxy for power (non-energy power) which many times is related to energy, but not exclusively nor always. For the US this HAS been aligned both through historic domestic oil, and then through the resurrection of Standard Oil through ARAMCO and then through the House of Saud. While one could make the argument that Iran, Iraq, Libya have been held down by “The Powers” or that the USSR was too, it is hard to believe that anyone in the future or the past would take their currencies seriously despite considerable energy assets. In a similar manner one could make the same argument about Mexico & Venezuela. Canada and Norway do get some respect, and Brazil may when they decide if they are gong to be an exporter of oil, or an exporter of manufactured goods. The contra indicator would be that two if not three countries have made this through manufacturing: Germany (pre euro), Japan, and increasingly China. In the final analysis, Money evolves from the Power to control resources under an ownership paradigm, so even prior to the discovery of means to access the thermodynamic energy of fossil fuels, it was possible to run monetary systems based on other resource control, generally speaking productive land in the old days. In the Industrial era though, the power of fossil fuels so swamped everything else that the money became tied to that resource primarily. Countries that have successfully run a positive balance sheet without their own supplies of energy have done so in a couple of ways, all mercantilist based. For the Germans, they got their industrial infrastructure rebuilt through the Marshall Plan and have been doing vendor financing of their production to their PIIGS clients for the last 40 years. Inthe latter stages they have undertaken the same kind of Ponzi Finance to keep the game rolling that the Banksters in the Anglo-American cartel have done. For the Chinese, they came in a day late and a Yuan Short on the Industrialization game, but made up for that by running the largest Slave labor camp of all time. Neither of these systems are contraindications of the connection between Oil and Money currently in practice. Far as the emerging economies with some Oil, count Mexico out of that equation, they are close to fresh out of the stuff. The rest of them are going to have a hard time holding onto what they do have, since Theft is likely to be the name of the game as global supplies diminish. It is hard to see how things will play out. We have a lot of manufactured goods that will continue to “work”, and clothes and other items that we can continue to use, but this usefulness will decline over time. This cushion of goods that we already own will cushion the fall somewhat. That is one reason I can understand a 20 or 30 year decline period. There are a lot of unknowns, though. If sanitation becomes a problem and antibiotics are no longer available, we could see many die of diseases, even though food and water may still be available. Or lack of fresh water could become a problem in an area, leading people to moving away, causing conflict in the new areas they move to. Agreed, the overhang of already produced goods that can be scavenged and salvaged will be part of a transitionary phase, at least in terms of things like keeping the lights on a while longer. The bigger problem in the near term is the political fallout resultant from ever increasing Unemployment and concommitant evisceration of various support structures in the social welfare states that have masked the negative outcomes of industrialization for these last 30 years or so. What makes the whole bizness so truly impossible to predict is how societies will react in aggregate to the mounting problems, or “Long Emergency” as Kunstler phrases it. My general feeling is that a tipping point will be reached somewhere along the line which creates massive social instability, leading to Civil Wars in the Nation States. That period will make any move toward more resilient and sustainable energy systems a moot point until it is over and done with. – I could never find any serious critique of the book or counter arguments for her logic. The mainstream of the financial world seems to have just dismissed the book as irrelevant. And yet, many of her arguments seemed persuasive to me. Is this a serious book or just a clever but misleading argument to sell a book? – What support I could find for the book seemed to came from libertarian sorts who want minimal government and often advocate a return to a gold standard. The Author was definitely NOT in favor of a return to the gold standard. And, she seemed to suggest that a Federal Reserve Bank should actually be a federal government entity that is actually owned and operated by our government (as it once was). Of course we have all heard the argument that the Fed should be independent from the government for all sorts of reasons – she disagrees. Aside from the Ron Paul type of position for eliminating the current Federal Reserve, is there a useful discussion to be had about alternatives to the current arrangement? If so, where/what is that discussion? BTW, what the heck is the FSofA? Far as Da Fed goes, this is a LONG topic to hash out. I’ll try to write a short version sometime tonight. BTW, did you catch my reply to your last set of questions on Reverse Engineering? I agree with RE, this ia long topic. Some errata for the moment, at least one state (north dakota) has a kind of “US State Fed” for its banks. My personal wish would be that several other states constituted these as well. At the minimum they would provide experience for individuals and for us to learn what “best practices” might actually be, instead of running the current circus. Whatever the legal structure of the Fed, the actual execution seems worse to me. In the creation of the Fed oh so long ago, there was significant concern about “Eastern Capture” and so there were various geographical limitations put in, one had to be “from” a region to serve in certain allocated slots. Our leadership now goes through some laughable contortions for some of the appointees, such as they once “lectured” in Kansas to qualify for those. Before you can discuss what the Federal Reserve is and what it does, you really have to get global understanding of what Money is, how it evolved and who controls it. I write on these subjects regularly. I’ll post some Links below here for some recent articles that can help you bone up on this subject. Ellen Brown is not an economist but she is a very bright lady who is looking for a monetary fix to the mess we are currently in. There are however many weaknesses in the type of Credit money system she is advocating for, way too complex a subject for me to address here. What is definitely true though is that if we are to try to use some form of Money as part of a resource distribution scheme, Money Creation has to be taken out of the hands of Private Banksters and put under Public Control. If you do not know that the Federal Reserve is NOT a part of Da Goobermint already, this is the first thing you need to know. The Federal Reserve is wholly owned by its member Banks, including of course the House of Rothschild, Chase (the Rockefeller bank), JP Morgan, Bank of Mellon and a few other notable historical Banking Houses, which all have common etiology running back to the Medici era, and quite possibly a good deal further back than that. Anyhow, here’s a few articles for you to read on Money, Gold and assorted related topics. The first one listed published on The Burning Platform as part of my Frostbite Falls series is Open and available for anyone to read. The rest are published in our Private Group on Reverse Engineering. You can find Michael Hudson’s article on his own Blog and also Zero Hedge Republished it as well. Here’s a short reading list of recent stuff. Another great post Gail, I appreciate your site and your insights. Perhaps at some point the U.S. citizenry could agree to contract the amount of spending on health care by cutting out the various middlemen and the stockholder profit motives by adopting some sort of national/universal health care system as is found in numerous other countries…most of which spend less on health care and realize better outcomes than is the case in the U.S. I concur with the premise that, as energy availability circumstances change, ingrained ways of thinking may have to change to adapt to the new realities. Healthier diets and increased exercise need to be adopted concurrently with any such national healthcare system. It is a shame that low-nutritional value, yet high calorie, foods are so inexpensive to consumers yet profitable to market. I truly hope the joys of home cooking are discovered by more folks…perhaps with an economic paradigm shift coming, more folks will have more time to live more simply and healthier. I agree. Part of today’s problem is the oversized salaries of doctors especially. Part of the problem is today’s food system, with its reliance on corn and over-processing. Part of the problem is consumers who don’t realize how bad this diet is, and how important exercise is. Hopefully you are right, and things will change for the better. I think your sense of economic growth and decline as “rising together” but “falling apart” is quite apt. Growth is actually a construction process, so decline a demolition process, after all. So it’s not like an “accordion” expanding and contracting. The variables are continuous, like equations, only in very narrow ranges. That’s certainly one of the great missing questions from the whole discussion. I think another key missing question is what really steers the pace and direction of economic development, once you think of it as a construction process. There’s a very reliable general answer. It’s always how the profits of the system are invested in changing the system. That’s true in growth and it’s true in confronting limits to growth both, that it’s always the construction done by the profits of the system that build it. You only need to connect their money with the instructions investors give for what the ask the economy to build with it. Those are good points. Profits for investors need to be aligned with jobs for people in this country. In many ways, globalization is a serious problem. Our workers are competing with people with a much lower standard of living. If they live in warmer parts of the world, they also don’t have the issues of building sturdy homes and heating them. Excellent points. Your construction/destruction framing, and Idea that reinvestment in construct leads to future profits there is totally awesome. Gail, Thanks for yet another thoughtful and thought-provoking article. In re-reading it, I kept feeling that your “old” and “new” renewables was onto something, but not quite right. A perhaps more useful perspective and descriptors is to think of “old” renewables as “small/simple/appropriate scale” renewables, and “new” renewables as “large/complex/industrial scale” renewables. There is a continuum between simplest and most complex, smallest and largest, appropriate (natural) and industrial. If energy descent results in deindustrialization, then small/simple/appropriate appears more likely to be able to be produced, maintained, and useful. That is a good point. The issue is really small/simple/ appropriate scale renewables versus large/complex/industrial scale renewable. It seems like large/complex/industrial scale renewables are just another dead-end, perhaps a little farther away. This will be a comment on ‘deconstruction’. Joel Salatin is the Virginia farmer made famous by Michael Pollan. His current book is Folks, This Ain’t Normal. In the chapter We Only Serve White Meat Here, beginning on page 93, he describes how the current model of fast food is inconsistent with local farms and thus will fail if energy restrictions require the relocalization of restaurant food. He gives quite a good detailed description of what a farmer has: a complete chicken in pastured rotation with cows and rabbits in a certain ratio which maximizes nutrient cycling. Availability is also seasonal–chickens are of tropical origin and do not thrive with snow on the ground. But what the fast food joints want is an unlimited supply of particular cuts or products (e.g., eggs) with no seasonality whatsoever. So…in a relocalized food economy fast food as we know it will disappear. (So will winter eggs.) It will probably be replaced with more eating at home and a return of the neighborhood diner which featured a chef skilled enough to make use of what was available seasonally and all the parts of the animal. Interestingly, there are a couple of local restaurants, using beef and pork, that specifically buy entire animals from local farmers. This is a return to the neighborhood diner model. This is either a cyclical return to the traditional low energy diner, or a modern variant on that diner, or a new way of running a restaurant with localization of supply…depending on how you want to look at it. I do not see this as at all disastrous, and heartily applaud it. I don’t think the fast food chains can do it because their mindset is completely different. The decline in the availability/use of all the various parts of animals is one of the changes over the years. I am sure these parts still get used somehow–as animal food, or as sausage, or something. But you don’t see liver on the menu at McDonald’s. While talking with my wife at dinner, it occurred to me how to capsulize the Joel Salatin/ Fast Food divide. Joel does not object at all to generic fast food–he thinks slow cookers are marvelous. He likes soups and stews. which are ready to eat. Joel is trying to maximize the nutritional product of the sun. The sun is capable of growing X amount of grass which is capable of supporting Y number of cows which need Z number of chickens to rotate behind them to clean up the cow patties and speed the recycling of nutrients. The Earth needs recycling of nutrients in order to sequester carbon and maintain a stable climate while maintaining the fertility of the soil and providing a healthy Earth for our children to inherit. He understands, and indeed celebrates, the fact that utilizing such products requires intelligence in the food preparation and consumption and recycling stages. The fast food companies are not on that page at all. They are trying to maximize profits any way they can. Only a fool or an Economist thinks that the two answers are even vaguely similar. The fast food companies require an enormous world wide distribution system which chews up fossil fuels and reduces humans to cogs in a machine. One goal is to eliminate thinking on the part of those employed in production and consumption, and to foist recycling off on some ‘methane capture’ industry. It is true that absolutely everything gets used in a global system. The problem is that it requires a global transportation network to get it to the place where each component is used. Contrast the delivery (in a small truck) of a few animals to a single restaurant where they are butchered and prepared and sold to patrons. (How they get around government regulations on inspection, I don’t know and won’t ask). The same for home use. My wife, when she was a young girl, went with her girlfriend to pick up live chickens at a store in the neighborhood. The chickens grazed out back of the store. The owners picked out a few chickens, gave them to the girls, who took them home, their mothers killed them and separated them into parts and prepared them for their families to eat. This was Jersey City, circa 1950. Think about the different logistical requirements of the current industrial system. And think about the transport fuels required to support that different logistical system. Can we go back? Of course we can if we have to. The obstacles are bone-headed government regulations designed to make sure that this sort of thing doesn’t endanger Frank Perdue or Don Tyson and the ignorance of the current crop of cooks. Would any system that evolves be exactly like Jersey City in the 1950s? No, but as somebody said ‘history doesn’t repeat itself, but it does rhyme’. One more angle on my wife and the chickens. Assume that a chicken is worth perhaps ten dollars, live, at a neighborhood store/henhouse. Our hypothetical little girl would pay 10 dollars and that would be that. A little fuel used for cooking and the GDP generated can’t be more than, say, 11 dollars. But if the chicken is grown on an industrial scale and sold in fractions to a wide variety of global enterprises who turn their little piece part into consumer and industrial end products, the GDP can be very much larger. For one thing, enormous amounts of transport fuels are consumed shipping the piece parts from the source to one and possibly more producers in each chain which results in something to sell the public or businesses. For example, the feathers can be sold to those who make feather meal which is sold to those who retail feather meal to farmers. So energy is used to heat and apply pressure and to grind and all this stuff has to be transported. I wouldn’t be surprised if there are hundreds of distinctly labeled products which can be made from a chicken. And assuming that the public is rich enough, they can be persuaded to part with a lot of money to get edible chicken parts which have been manipulated to exactly fit their idea of a tasty snack. For example, many children today do not realize that chickens have bones. So I would just guess that a ten dollar chicken can be turned into 50 dollars of GDP. So the GDP multiplier is 50 dollars vs 10 dollars, or 5 to 1. This is like fractional reserve banking. A dollar on deposit can be leveraged into 15 or 25 or 50 dollars of debt. A 10 dollar chicken magically becomes the 50 dollar chicken. Everyone is intimately familiar, since 2008, of the things that can go wrong with leveraged financial systems. What about leveraged chickens? What immediately becomes obvious is that transport fuels make the whole industrial cycle and the magic multiplication of GDP possible. This magic multiplication of GDP shows up as income for someone which permits them to show the bank earnings statements and thus borrow more money. And so it goes around. Your point about leveraged chickens is a good one. I got some of the same impression as to what was happening when I got into a discussion with someone about whether US manufacturing was expanding, and the person provided links to US manufacturing statistics. A lot of the food that was minimally processed before is now manufactured into something which sells for more money. I think the example was boxes of cereal with 4 cents worth of corn in them. I personally try to buy food is as close to the original condition as possible–produce, dried beans or peas, oatmeal, salt, fish, etc.